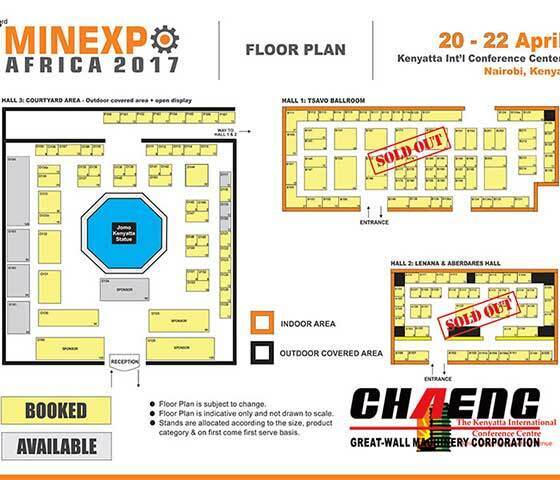 MINEXPO KENYA is hold by EXPOGROUP which is the largest international professional mining equipment exhibition in East Africa. Each session fully shows the development trend of the latest technology and innovative products in the field of world mining equipment and technology, engineering machinery and mining machinery. In 2016, the exhibition has attracted 100 professional exhibitor from more than 15 countries and regions such as China, Egypt, France, Germany, India, Indonesia, Iran, Kuwait, Saudi Arabia, Italy, Spain, Tanzania and the United Arab Emirates. Great Wall Corporation look forward to talking with the world first-class enterprises for the bright future of engineering construction. At this time, Great Wall Corporation will attend with its Green updated GRM series vertical mills, ball mill, energy-efficient rotary kiln and the industrial slag grinding new technology. The company has formed the perfect operation and management system in design and development, product manufacturing, market promotion, equipment installation and after sales service.